The fee for tooth replacement with dental implants depends on several factors, including the number of teeth being replaced and the number of dental implants required to support your replacement teeth. Some additional procedures may be required prior to the placement of your dental implants to ensure the long-term health of your dental implants. To obtain a specific fee estimate, it is necessary to have a doctor examine your mouth. After a thorough diagnostic examination, your dentist will recommend the treatment that is best for you. 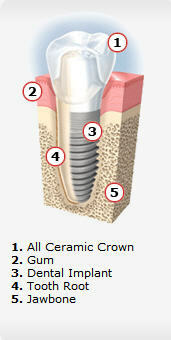 At our Danvers Dental Implant office we are currently offering a $500.00 off dental implant surgery! Our Danvers dental implant office offers state-of-the-art guided surgical techniques are convenient alternatives to place dental implants and allow you to have the dental implant placed in a single session using keyhole surgery. This new method has significantly simplified the procedure, for both patients and dentists. The major advantage of the guided surgical technique is the minimal amount of manipulation of the soft tissue due to keyhole surgery. This significantly reduces the healing time and the discomfort normally associated with traditional dental implant surgical techniques. Danvers Dental Implants - Anyone who is missing one or more teeth due to injury, disease or tooth decay may be a candidate for dental implants. The dental implant is stable and comfortable. No adjustment is needed after placement. Normally, it will serve its owner for life.